Sarah Todd enjoys collaborating with collectors and designers to create stunning custom works of art that are both personal and perfect for homes, offices, gifts or commercial spaces. 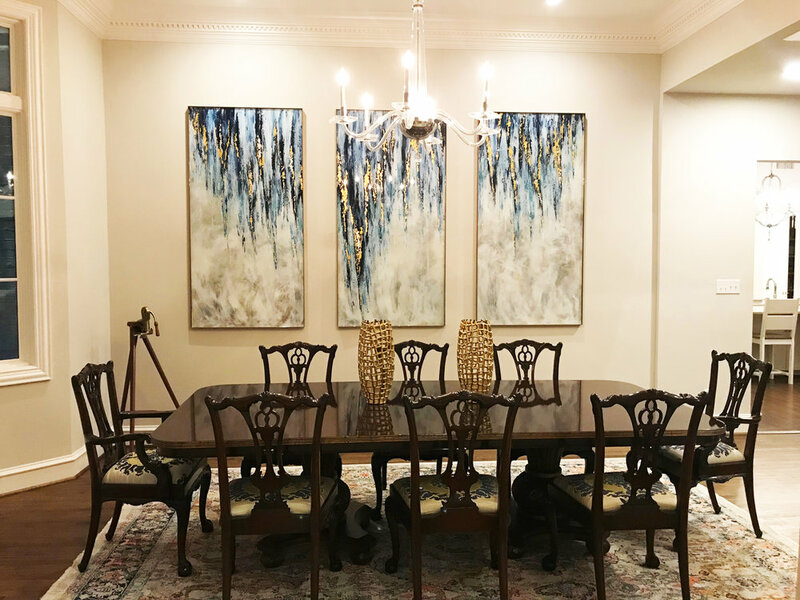 Whether you are in the building stage of your home/office, remodeling, redecorating, or simply have been waiting for the perfect piece of art for your space, commissioning a painting is a great way to meet the creative elements you desire in a work of art. If you have multiple spaces that you’d like to display Sarah’s work, she is able to create pieces that individually speak for their own whilst still complementing each other and their surroundings. A 50% deposit is required to get on Sarah’s commission schedule. The collector previews the commission near completion for final approval. The remaining 50% is due upon completion. In the initial consultation, Sarah hears the collector’s expectations. The consultation can be in person (if in the Dallas, Texas area) or through FaceTime. Sarah and the collector collaborate to design the perfect piece for the space depending on colors, composition, and size that best fit the collector’s style and the space. An estimated completion time will be given prior to consultation.